Need more evidence that transportation infrastructure investment isn’t keeping pace with maintenance and construction needs? The proof is in the pizza. 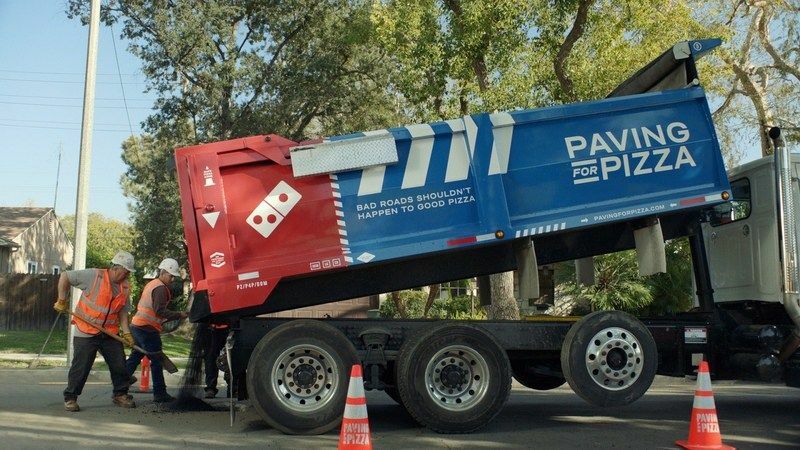 Domino’s Pizza this week announced its “Paving for Pizza” campaign, which offers pothole repair grants to help municipalities “smooth the ride home” for its boxed pies. The company says it has patched up roads in Bartonville, Texas; Milford, Delaware; Athens, Georgia and Burbank, California. Domino’s is not disclosing individual grant amounts, or its total spend on the promotion, only that each award will be the same, Public Relations Director Jenny Fouracre wrote in an email. The Washington Post and other media report the grants are for $5,000. The company will accept nominations for three months, Fouracre said. The campaign is drawing support from better roads groups such as Fix Alabama’s Roads and Mississippi Road Builders. It also is generating lots of television and radio coverage in the Ann Arbor, Mich.-based chain’s markets, in addition to social media traction with #pavingforpizza.